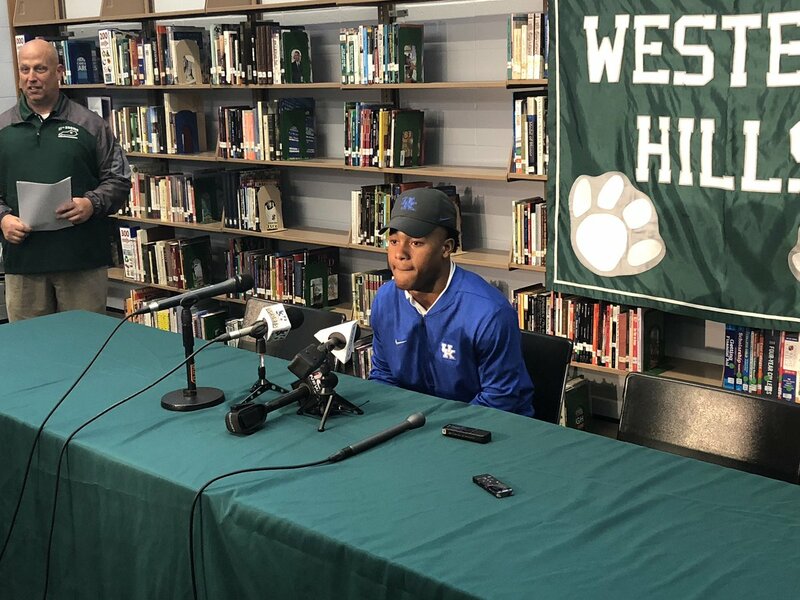 Wandale Robinson will be a Kentucky Wildcat. The state’s most electric playmaker turned down Ohio State, Alabama, Nebraska, Michigan and Purdue to stay home. Arguably the biggest Kentucky commitment in five years, Robinson brings a lot to the table. Up until yesterday Ryan Lemond was the only one who still believed Wandale could end up at Kentucky. While many recruiting experts hedged their bets to say it was a toss up, Kentucky had almost been completely been written off as a contender. Kentucky recruited Robinson for quite some time. Mark Stoops turned it up a notch this spring when Marrow took over in-state recruiting. The move came at the perfect time. A few months after Marrow entered the picture, so did Ohio State and Alabama. Kentucky’s relationship with Robinson outlasted the pursuit of others, largely thanks to Marrow’s efforts. “Building a wall around the state” is a priority for every college football head coach. It’s even more important when a state that usually isn’t rich with talent produces eight four-star players. While some decided to take their talents elsewhere, Kentucky was able to keep the future Mr. Football. Robinson brings something to the table only a few can. He is a highlight-maker with an effusive personality. Landon Young and Drake Jackson’s contributions to the UK football program have paved the way for an excellent rushing attack, but Kash Daniel speaks to fans in a way few can. His connection with the BBN is immeasurable. It’s difficult to replicate how Kash reaches fans, but Wandale is the type of person that can do just that. There will be an offensive production vacuum after Benny Snell’s departure. After three years of power football, Kentucky’s offense will change in 2019. With a year of experience, the ball will be put in Terry Wilson’s hands. Now he’ll have a couple of different playmakers at his side. Lynn Bowden has quickly become Wilson’s go-to receiver. Bowden caught 13 of Wilson’s 22 completions against Missouri, six more than the rest of the receivers combined. There’s room for Wandale to emerge as a playmaker, one that can do incredible things from a variety of positions. Many compare his style to Bowden, but considering their similar frame, Rondale Moore might be the better comparison. If you’ve watched one Purdue game this year, that should be enough to convince you this kid’s got what it takes to make plays right away. 4. More Dominos to Follow? There are still a few highly-ranked uncommitted prospects from Kentucky. The addition of a star like Wandale could convince Milton Wright and J.J. Weaver to join him in Lexington. Weaver will make his decision one month from tomorrow. The momentum from Wandale’s decision could last long enough to give Mark Stoops another in-state Yahtzee! Bowden caught 13 of Wilson’s 22 completions against Missouri, six more than the rest of the receivers combined. 22-13 = 9. 13-6= 7. What happened with the 2 missing completions ? KSR math or magic ? After watching Nick’s broadcast, I forgot to take into account his excitement level over this commitment. One guy who has been excited as long as me for these days. I believe he was subtracting Benny’s two catches since he’s not a receiver. That would account for the error. Great to see a Kentucky high school star stay and play for his state school! You’re writing off the redshirt RBs too quickly. Time will tell what our offense becomes next season. I agree kjd. What I saw from what bit Rodriguez played is that he could be every bit the steam roller Snell is. Smoke and rodriguez, imo, will both surpass AJ rose next year .. and AJ is good! Robinson is going to be a receiver. The “missing 2” I think comes from the fact Terry only threw 12 catches to Lynn (Gunnar threw the other.) So you take one completion away from Lynn and one away from Terry, you have 2. Regardless of the algebra, 12 of Terry’s completions went to Lynn and 10 went to anybody else, which proves the point that Lynn is definitely Terry’s favorite target. That’s what happens when u catch every pass thrown ur way. As terry develops he will find cj and bouvier more often. Hopefully these coaches will UTILIZE him so he can be successful (cough , cough Eddie Gran ) Poor C.J Conrad. Couldn’t agree more. Hopefully Eddie is fired or leaves. He’s such a POS. I agree. Let’s fire the OC that’s been apart of 3 straight winning records his first 3 years on the job. Eddie Gran isn’t terrible. We have some serious offensive weapons that are going to waste. That’s the problem. Lynn can throw , run , receiver, punt return. He is the jack of all trades. Put him in the back field and see what he can do. I don’t i ever seen him receive a handoff , jet sweep , play action , wildcat formation or anything. Can’t design a play to get him in open field to do what he is good at. That is making people miss. I wish some of these so-called fans would leave…the POS like JohnnyCheese must be too damn young to remember when we were losing games 65-0 (1996 vs Florida) or worse!!! How in the hell can a fan want one of these coaches fired. I don’t get it. I think it’s because most UK fans want that up tempo air raid offense like when we had no defense and had to outscore people to win. That’s just not who this team is. This is a defensive team. My only fault with Gran is there are times when he needs to be more creative. We used one of our best plays I’ve seen him call against Murray state. Sometimes he needs to have more confidence in Terry and open up the playbook.